We’re going national! Congrats to our girls for getting into Swing Central - a national blind audition selection process. Read the Crosscut article and the KUOW article. 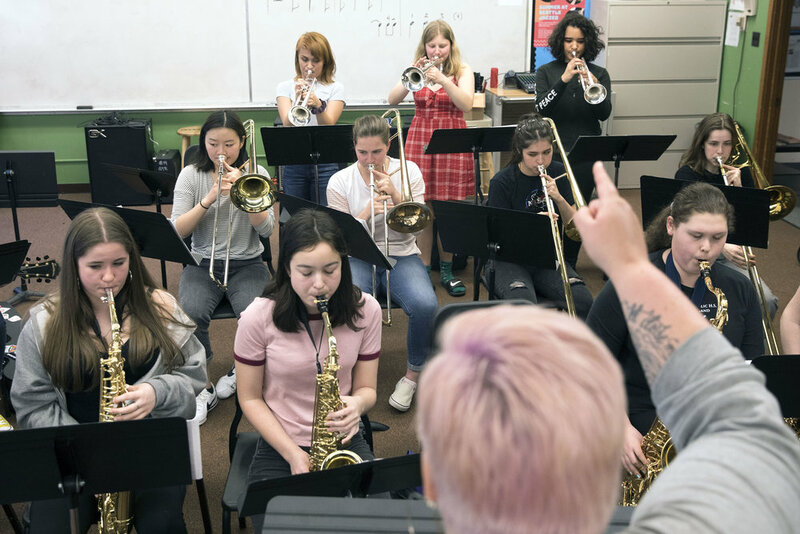 Swing Central Jazz is a three-day workshop and competition with a collective approach to big band jazz instruction. Led by pianist/composer/educator Marcus Roberts, the clinician team includes a wide range of jazz educators such as Jason Marsalis, Jim Ketch (Associate Director), Brianna Thomas and Wycliffe Gordon. Agoura High School Jazz “A” (Agoura Hills, CA) – Bob Hackett, dir. Albemarle High School Jazz Ensemble (Charlottesville, VA) – Greg Thomas, dir. Byron Center High School Jazz Orchestra (Byron Center, MI) – Marc Townley, dir. Calabasas Jazz “A” Band (Calabasas, CA) – Aaron Kohen, dir. Enloe High School Jazz Ambassadors (Raleigh, NC) – Robert C. Hunter, dir. Jazz at Lincoln Center Youth Big Band (New York, NY) – Matt Buttermann, dir. Memphis Central High School Jazz Band (Memphis, TN) – Ollie Liddell, dir. Plymouth Canton Educational Park John Coltrane Ensemble (Canton, MI) – Noah Bellamy, dir. Rio Americano PM Jazz Ensemble (Sacramento, CA) – Maxwell Kiesner, dir. Seattle JazzED Girls Ellington Project (Seattle, WA) – Kelly Clingan, dir. Spruce Creek High School 12 O’Clock Jazz Ensemble (Port Orange, FL) – Robert Bosma, dir. Tarpon Springs High School Jazz Ensemble (Tarpon Springs, FL) – Chris De León, dir.